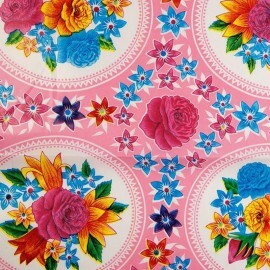 Original pink Rosario oilcloth fabric, for a perfect vintage decoration! 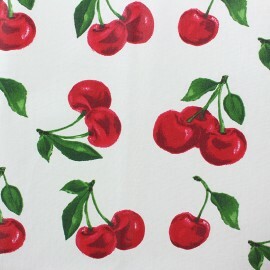 From the famous Kitsch Kitchen brand, this high-quality oilcloth fabric will be perfect as a tablecloth in the kitchen but also on the garden table! Flexible, it is also ideal for your vintage and colorful accessories: bags, accessories, aprons, tablecloths, and much more. 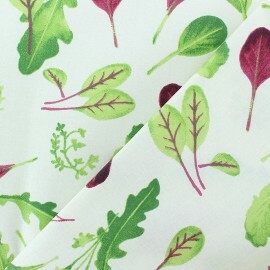 Very nice, 100% cotton, Mesclun coated fabric with pretty salad leaves patterns. 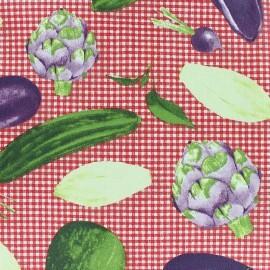 Fall for these veggie patterns on a raw background and the matte finish of this coated cotton. Ideal for making outdoor cushions, clutches, accessories, tablecloths, aprons and all waterproof seams ... for your summer salad party. 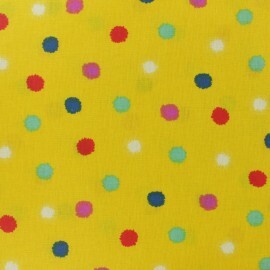 Discover this colorful Mini Pompon 100% Coated cretonne cotton fabric.Flexible and easy to sew, this Oeko-tex certified cotton fabric with a pretty yellow background with multicolor dots will suit to all your desires for clothing or decoration creations. 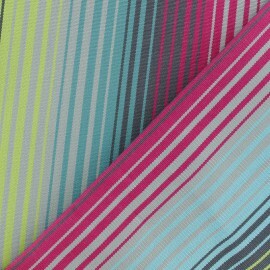 Discover this colorful and trendy Kota 100% Coated cretonne cotton fabric. Want to escape? 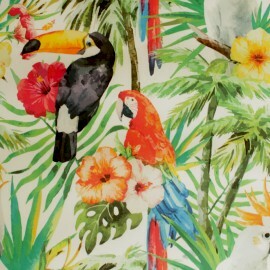 Fall for this coated cretonne cotton fabric with green parrot patterns and add colors in your life! Flexible and easy to sew, this cotton fabric, Oeko-tex certified, with a coral orange background will suit to all your desires for clothing or decoration creations. 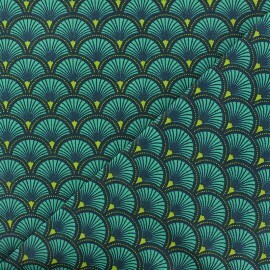 Discover this colorful and trendy Kota 100% Coated cretonne cotton fabric. Want to escape? 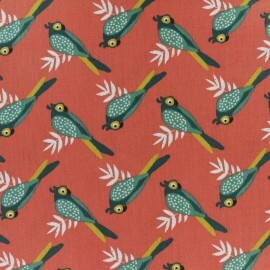 Fall for this coated cretonne cotton fabric with green parrot patterns and add colors in your life! 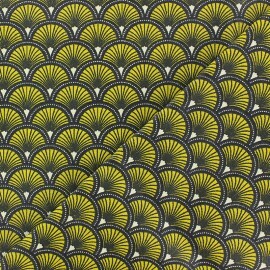 Flexible and easy to sew, this cotton fabric Oeko-tex certified, with a curry yellow background will suit to all your desires for clothing or decoration creations. 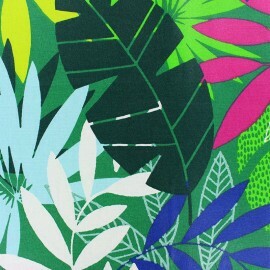 A beautiful Rio Special Outdoor canvas fabric with green exotic leaves and parrots patterns. This high-quality fabric is very resistant with an anti-stain (Teflon) and anti-UV treatment. Take advantage of its large width (160 cm) to create or renovate your sun shade sails and stores. Make colorful beanbags and outdoor cushions for your garden and pool house. 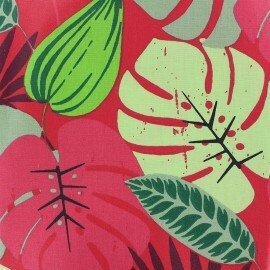 A beautiful Sumatra Special Outdoor canvas fabric with green exotic leaves patterns. This high-quality fabric is very resistant with an anti-stain (Teflon) and anti-UV treatment. Take advantage of its large width (160 cm) to create or renovate your sun shade sails and stores. Make colorful beanbags and outdoor cushions for your garden and pool house. 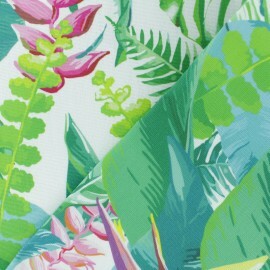 A beautiful Bornéo Special Outdoor canvas fabric with exotics flowers and leaves pattern. This high-quality fabric is very resistant with an anti-stain (Teflon) and anti-UV treatment. Take advantage of its large width (160 cm) to create or renovate your sun shade sails and stores. Make colorful beanbags and outdoor cushions for your garden and pool house. 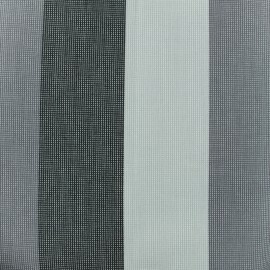 A beautiful Oeko-Tex-certified Boston Outdoor plain canvas fabric with grey stripes. This high-quality fabric is very resistant with an anti-stain (Teflon) and anti-UV treatment. Take advantage of its large width (320 cm) to create or renovate your sun shade sails and stores. Make colorful beanbags and outdoor cushions for your garden and pool house. 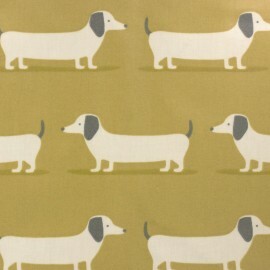 This Vermont Playa canvas fabric is high-quality fabric and very resistant. 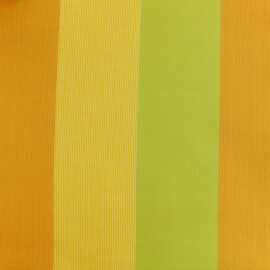 Made with an Anti-stain treatment (Teflon) and anti-UV, its small width (45cm), it is ideal to renovate your beach chairs with this beautiful fabric with yellow, orange and green tripes! Have a perfect summer break! 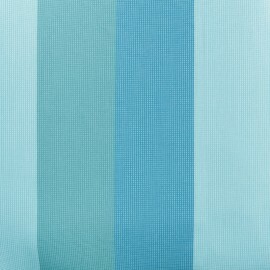 This Amalfi Playa canvas fabric is high-quality fabric and very resistant. 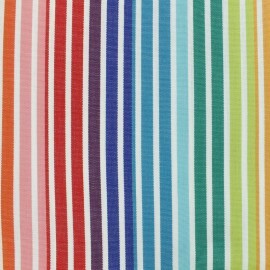 Made with an Anti-stain treatment (Teflon) and anti-UV, its small width (45cm), it is ideal to renovate your beach chairs with this beautiful fabric with multicolor stripes! Have a perfect summer beak ! 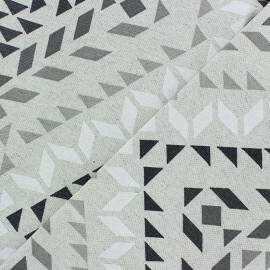 This Monaco Playa canvas fabric is high-quality fabric and very resistant. 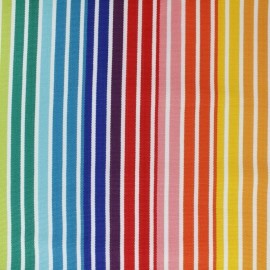 Made with an Anti-stain treatment (Teflon) and anti-UV, its small width (45cm), it is ideal to renovate your beach chairs with this beautiful fabric with multicolor stripes! Have a perfect summer beak ! 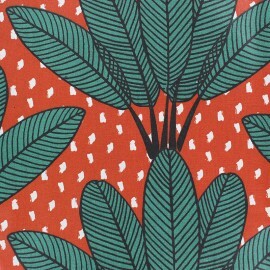 This Palermo canvas fabric is high-quality fabric and very resistant, special for outdoor use. Made with an Anti-stain treatment (Teflon) and anti-UV, its small width (44cm), it is ideal to renovate your beach chairs! 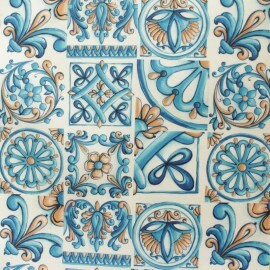 Be original with this Palermo outdoor fabric with beautiful Mediterranean graphic tiles patterns on blue tones. 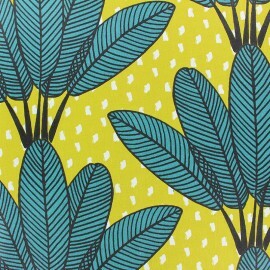 This Rio canvas fabric is high-quality fabric and very resistant, special for outdoor use. Made with an Anti-stain treatment (Teflon) and anti-UV, its small width (44cm), it is ideal to renovate your beach chairs! 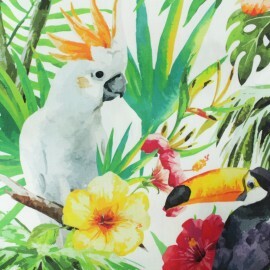 Be original with this Rio outdoor fabric with jungle patterns with beautiful exotic birds: toucans, parrots and cockatoo. 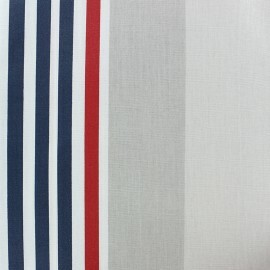 This Anduze canvas fabric is high-quality fabric and very resistant, special for outdoor use. 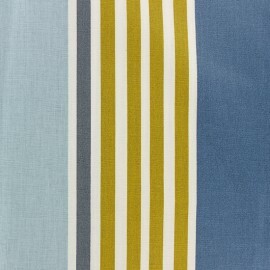 Made with an Anti-stain treatment (Teflon) and anti-UV, its small width (44cm), it is ideal to renovate your beach chairs! 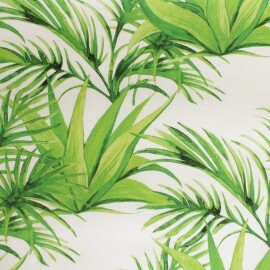 Be original with this Anduze outdoor fabric with large green palms leaves patterns on a white background. 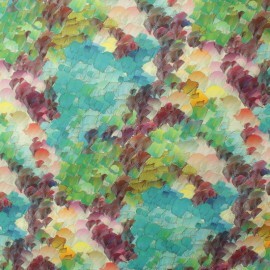 This Giverny canvas fabric is high-quality fabric and very resistant, special for outdoor use. 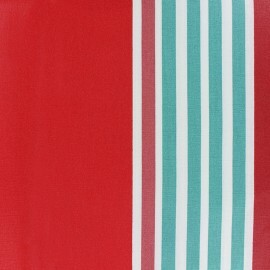 Made with an Anti-stain treatment (Teflon) and anti-UV, its small width (44cm), it is ideal to renovate your beach chairs! 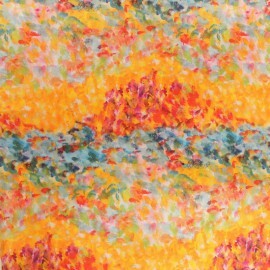 Be original with this Giverny outdoor fabric, inspired by French Impressionism painting, with its colored brushstrokes! 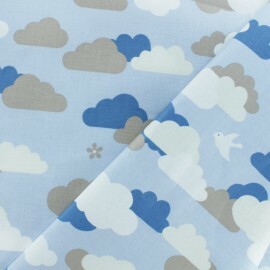 This Nami canvas fabric is high-quality fabric and very resistant, special for outdoor use. 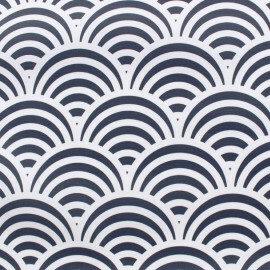 Made with an Anti-stain treatment (Teflon) and anti-UV, its small width (45cm), it is ideal to renovate your beach chairs with a beautiful Navy blue and white Japanese graphic patterns, make your pool chairs trendy this summer! 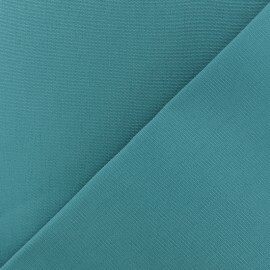 This Nami canvas fabric is high-quality fabric and very resistant, special for outdoor use. Made with an Anti-stain treatment (Teflon) and anti-UV, its small width (45cm), it is ideal to renovate your beach chairs with a beautiful turquoise blue and white Japanese graphic patterns, make your pool chairs trendy this summer! 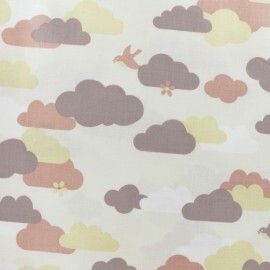 This Nami canvas fabric is high-quality fabric and very resistant, special for outdoor use. 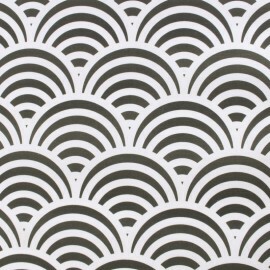 Made with an Anti-stain treatment (Teflon) and anti-UV, its small width (45cm), it is ideal to renovate your beach chairs with a beautiful dark grey and white Japanese graphic patterns, make your pool chairs trendy this summer! 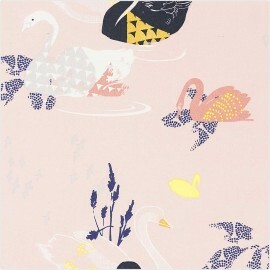 This Nami canvas fabric is high-quality fabric and very resistant, special for outdoor use. 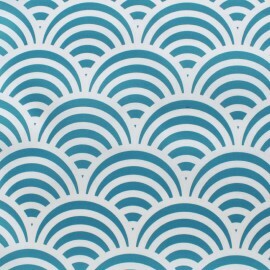 Made with an Anti-stain treatment (Teflon) and anti-UV, its small width (45cm), it is ideal to renovate your beach chairs with a beautiful lagoon blue and white Japanese graphic patterns, make your pool chairs trendy this summer! 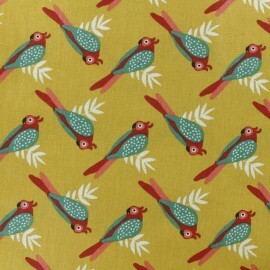 Our upholstery fabric online shop is the place the buy the perfect and latest fabrics. If you want to transform your outdoor (patio, balcony, porch…) into a real living place, you are at the perfect location. 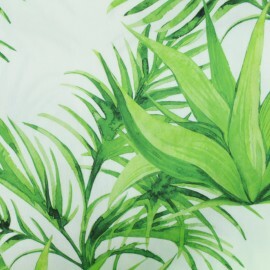 Either you want to renovate outdoor pieces of furniture, create an outdoor tablecloth our sew sunbrellas and cushions, our fabrics are made for you. Do not hesitate to bring your fabric outdoor! Enjoy our robust, durable and easy-to-clean fabrics which provide functionality to your outdoor living space. Made of polyester, Teflon, 100% cotton, Dralon, or PVC, be sure to find the best material for your upholstery project. Discover a wide selection of rich textured fabrics and outdoor fabric by the yard, from faux leather, oilcloth fabric, cotton, and velvet, to coated, poplin and canvas fabric. 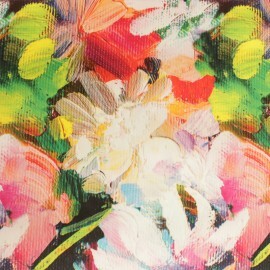 Enjoy vibrant colors and patterns, from floral prints, animal pattern, and checked pattern, to chevrons fabrics, striped canvas, blue, pink, grey and more. 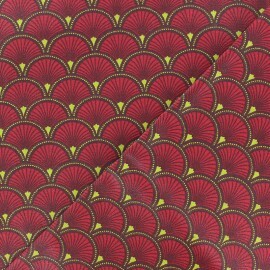 Some fabrics are sold with a wide width, other are regular width. Moreover, all of our outdoor canvas are designed to repel water and withstand wind, storm, rain and cope with bad weather. Treated during the manufacturing process, outdoor fabrics are resistant, insulating and great for outdoor types of furniture, such as sunbrellas, and so forth. Plus, our minimum order quantity is 10 cm. 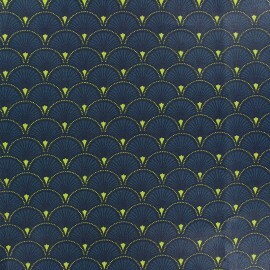 If you need more, buy our outdoor fabric by the meter or by the yard. 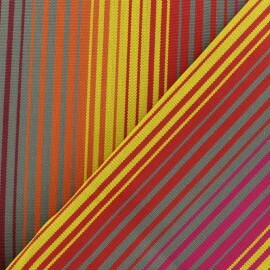 Don’t forget to order a swatch or several fabrics remnants prior to ordering your outdoor fabric. A patio or a balcony is as important as a dining room or a bedroom, that is why you should give color, comfort, and style to your outside space. Do you wish to change your garden furniture? Do not throw it away. Instead, replace your fade and old-looking outdoor fabric with our outdoor fabric. If you create wonderful pieces, you will want to spend most of your free time in your renovated patio. Start your balcony makeover by covering your patio sofa with UV-resistant fabric, suitable for outdoor. Sew cute little outdoor cushions and outdoor chair to feel comfortable with our lightweight cotton canvas outdoor fabric available in pink, blue, yellow or brown. Create practical replacement cushions for your outdoor cushion, thanks to our fabric by the yards. Be bold and try to mix and match our outdoor fabric with linen upholstery canvas fabric or burlap. Make a big pergola canopy and awning with our outdoor fabric. Also, you can use your sewing machine for creating light outdoor shades and curtains. Looking for a DIY project? Redo your patio lounge with outdoor fabric. 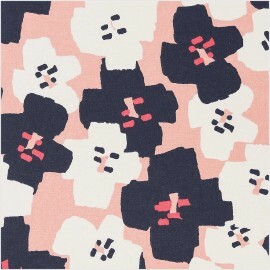 Cover your outdoor coffee table or side table with our oilcloth fabric. Make yourself comfortable and stitch a linen hammock or a swing chair to spend your summer in. Feel free to use our upholstery supplies, such as nails, and webbings, in order to create unique pieces. 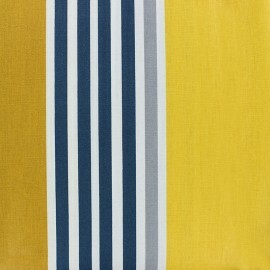 Refurbish your old folding camping chair or beach chair with our deckchair outdoor fabric. 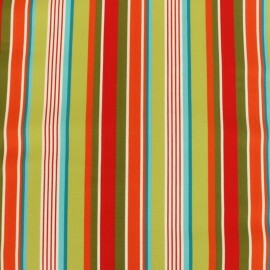 Furthermore, our outdoor fabric will be perfect for sunbed and porch swing creations. Finally, our outdoor fabric can be used for indoor creations, as an indoor outdoor fabric. Use our fleece, canvas, neoprene fabric, duck cloth and more.